Home/Explained Simply/What is JSON Web Token? 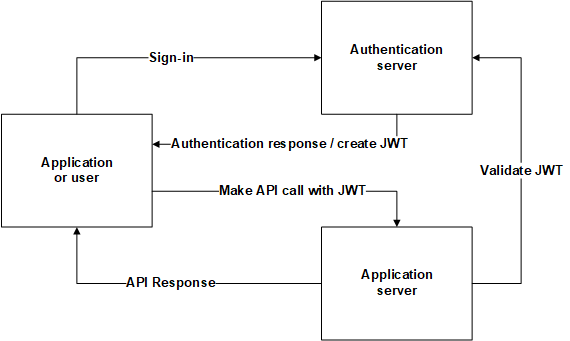 JWT or JSON Web Token is JSON base standard for credential access (RFC 7519). The token contains access claims. For example the authentication server can generate token with claim “edit article” and the user with this claim can access functionality in REST API to “edit article”. JSON Web Token contains 3 elements: Header (xxxx), Payload (yyyy) and Signature (zzzz). Every part of token is Base64 encoded. The header contains information about the token type and signature algorithm. Property “typ” contains the type and property “alg” contains the signature algorithm. In our example we use HMAC SHA-256 for signature. The payload contains user “claims”. It can be user data or access options. You can add as many options as you want. Calculate Base64 URL encoded header and payload. successfully validates the token, it processes the call.